Ni Hao! We had so much fun with our Geography Curriculum last week learning about China! Last week we learned all of the continents and oceans. 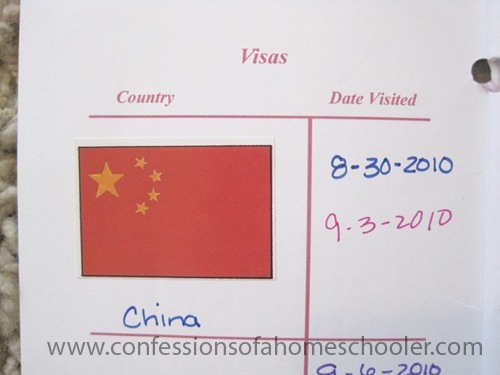 We review those each day and added in the location of China is this week as well. The Indian Ocean is my preschooler’s favorite one, so she always points to that one first. We learned about some fun animals found in China, here they are holding up their waterfall books with their favorite animal. And this week we were able to visit a zoo that had an Asian Exhibit which included all of our animals but the pandas! That was too cool! I’ll post pictures shortly as that deserves a post all of it’s own. We learned fun facts about the Great Wall of China then made our own miniature model of it, I’ll post more on this later, but here it is in progress. And for family fun night, we ended our week with a field trip to one of our favorite Chinese restaurants complete with lessons on how to hold chopsticks. Oh, and of course we said “Ni Hao” to our waitress! I’ll post the instructions to the individual crafts later on so you can have your own fun learning about China! Love it! Can't wait to "travel" to China too. Thanks for sharing. Is this part of the curriculum I just found out you created? Looks awesome! How fun! That is how learning should be…we might have to visit China ourselves soon! Thank you for all the work you put into sharing these great ideas. Your handmade paper turned out better than mine. There's a great series of books called "The Story of ______" and it tells how 3 brothers invented noodles, paper, kites, and something else in China, super cute. Thanks for sharing! I love making learning fun for the kids! You have such great ideas! Today we will start your letter of the week curriculum. Erica!!! This ALL looks like SOOOOO much fun! I can't wait to use your curriculum next year!!!!!!! I simply CANNOT wait!!!!!!!!!! Wow, this looks great. You are definitely an inspiration to me (a very very newbie! )Thanks for sharing and for the great pics to go along with the post!